The highly anticipated New Album “All Is Not For All” from the U.A.E. 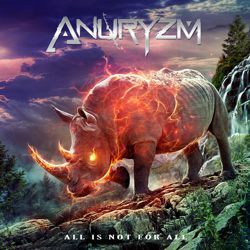 prog metal band “Anuryzm” is set for release on June 15, 2015 via Melodic Revolution Records. 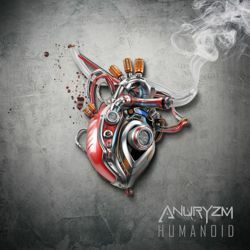 “Humanoid” is the first single to be released from “All Is Not For Al,l” it’s the perfect introduction to the new album combining technical guitar riffs with vacillating harmonious and powerful vocals. The track glides effortlessly through euphonious and symphonic synth and acoustic sections while at times incorporating traces of eastern and jazz like arrangements. “Humanoid” has been released as a Digital Single and is available via iTunes, Amazon, CD Baby, Tidal, Bandcamp, Xbox Music and more. According to the band: “Humanoid” is a Sci-Fi epic about being watched by intelligent ETs. They recognize that humans are a flawed and doomed species. They question whether they started us off on the right path to technological awakening or whether it was a mistake to give away knowledge. “All Is Not For All” follows their critically acclaimed debut album “Worm’s Eye View” released in 2011. The new album is an uncompromising collection of carefully calculated songs with an esoteric approach to the instrumentation, and masterful compositions on this release. “All Is Not For All” effortlessly melds elements of progressive metal with power, death, and even thrash metal to solidify their own unique sound. If you listen closely you may even hear elements and an underlying familiarity of bands that have influenced Anuryzm …….over the years, touches of Opeth, Megadeth, Iron Maiden and even Queensrÿche make for an incredibly compelling listen. Additionally, the band have raised an army of venerable musicians from the music world to take up arms on the new album, with guest collaborations from the likes of Michael Lepond (Symphony X), Uri Dijk (Textures & Ethereal), Charlie Zeleny (Whiplash), and interestingly, Christopher Chaplin (the youngest son of the late icon Charlie Chaplin) who plays Cello on “Oceans Apart”. John Bakhos (Guitars & Synths) Nadeem Bibby (Vocals), Miltiadis Kyvernitis (Additional Backing Vocals) Michael LePond (Bass) Charley Zeleny (Drums), Uri Dijk (Synths), Christopher Chaplin (Orchestral Strings on Oceans Apart). Nadeem Bibby (Vocals), John Bakhos (Guitars), Jay Jahed (Synths), Imad Dahleh (Drums), Rany Battikh (Bass). Three time Grammy Award Winning Audio Mastering Engineer; Bob Katz. The Band have also been featured in: Terrorizer, Rolling Stone, Metal Underground and more.